We moved over here in 1975, and at that point the neighborhood was changing racially. It was a lot of people that you didn’t even know they were moving. The Caucasians—there were just trucks that would pull up and they would move overnight….We started going to St. Sabina because that’s what you generally did—back in the day you went to whatever parish was in your neighborhood. At that point…because of the migration out of the neighborhood, it was changing, and money wasn’t coming in. You know, it had transitioned from a white parish which was mostly Irish to a black parish, and we didn’t have very many members at that time, and we thought we were going to close, but Father Mike [Pfleger] came there, and he really rebuilt the parish and he rebuilt this area. I actually think St. Sabina Church is the rock of this area. And I might be a little prejudiced because I go there, but this is what I see in the neighborhood. [Father Pfleger] even tries to work with the other churches and denominations, bring the other pastors and things together for different causes that will help our neighborhood. He has a vision, and he’s open to the other pastors’ visions and things for the area, too, and he tries to get all of us in the area to work together, not against one another, but together. That’s the only way we’re gonna try to keep the neighborhood stable. What I liked most about our neighborhood as my children were growing up, I liked how we stuck together as neighbors. We all looked out for one another, you know; everybody on the block raised one another’s children. But now…the neighborhood is changing again, and a lot of our friends and things in the neighborhood have passed on. Now we have people that move in, the kids keep the property and rent it out rather than living in the property…So I see the neighborhood changing a little bit on account of that. All the children that came up through our block, they won’t live here on the block…this is not where they want to live, even though [some of them] still go to St. Sabina Church, and I guess a lot of the young people feel that way. It’s because of the violence in the neighborhood and stuff now. They don’t want to raise their children in the neighborhood, they don’t want their children going to school around here. So they move out to other neighborhoods. That’s one of the things that I don’t like, that the young people are not reinvesting in the neighborhood, some of them anyway. Other than that—I won’t leave, I really don’t want to leave the neighborhood…I like the area because I could walk to church if I wanted to, and it’s just…been my life…especially now that I’m older and retired, most of the stuff that I do is through the church. I’m not so afraid of the neighborhood, but it’s not as relaxed as it used to be, where you just get out, and go out on the front, and talk. Some of the people, when they come into the block now––and our block club used to be real strong, but it’s not as strong as it used to be––we would go and greet people…, [but] they don’t wanna be greeted, you know, everybody has their own personal life, and it’s not a community life. And I think that’s what we’re losing, the community life. But like I said, probably if our younger people would come back to the neighborhood or reinvest in the neighborhood, it would stay more stable over the long run. Father Mike, he’s a great supporter of young people…you’ve gotta be a person that has a heart for the young people, because the older people are not gonna always be here.… And if you don’t have a younger congregation you’ll die. That’s with anything—if you don’t have the younger people coming in and try to raise them up to be stable, to be in the community too, to keep the community strong. I love my neighborhood even though it’s not what it used to be, but everything changes, and as long as I can, I would try to stay here and do what I can. 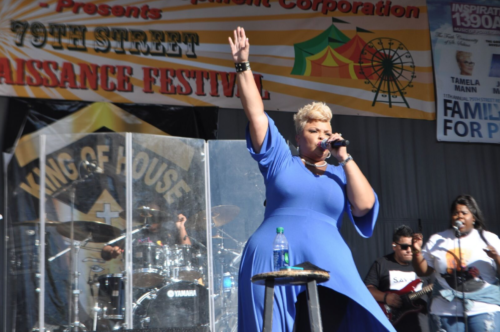 “Does everyone know that you have greatness inside of you?” proclaims the emcee, affirming the jubilant tone of the 11th Annual 79th Street Renaissance Festival. 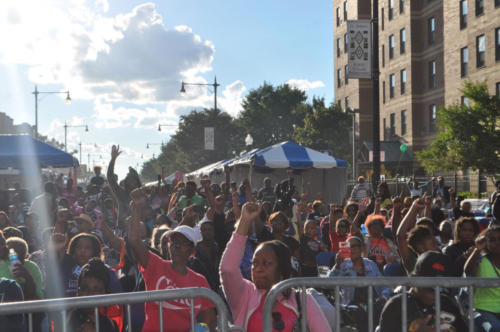 Held on September 10 between Racine Avenue and Loomis Boulevard, the family-friendly festival, which draws 15,000 attendees yearly, celebrates the revitalization and bright future of Auburn Gresham. On the main stage, the emcee praises the Lord for the sunny day that’s replaced the early-morning clouds, and onlookers cheer from their blue fold-up chairs. She steps to the side as Muppet-like puppets begin singing along to gospel music, bopping up and down before a hanging #stoptheviolence banner. Renaissance Park sits directly in the center of the four-block stretch, where a second, smaller stage plays house music that churns out a “Chica-a-a-a-go” every few minutes. In a field near Loomis, kids eagerly anticipate pony and wagon rides, as well as pigs and sheep in the petting zoo. The festival is bookended on the west by a makeshift court of two basketball hoops. Power of Love. Humility and Strength. Intelligence & Ingenuity. Friendship and Interdependence. 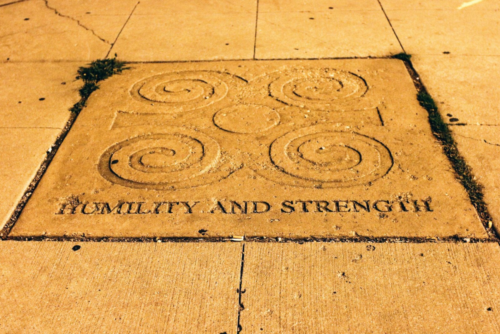 You can’t walk thirty steps on the sidewalk of 79th Street without having your feet touch these words—or their accompanying symbols—between Wallace Street and Ashland Avenue. Engraved on large concrete tiles that blend into the path, the patterns are both a prominent fixture of the boulevard and an easily overlooked example of public art. 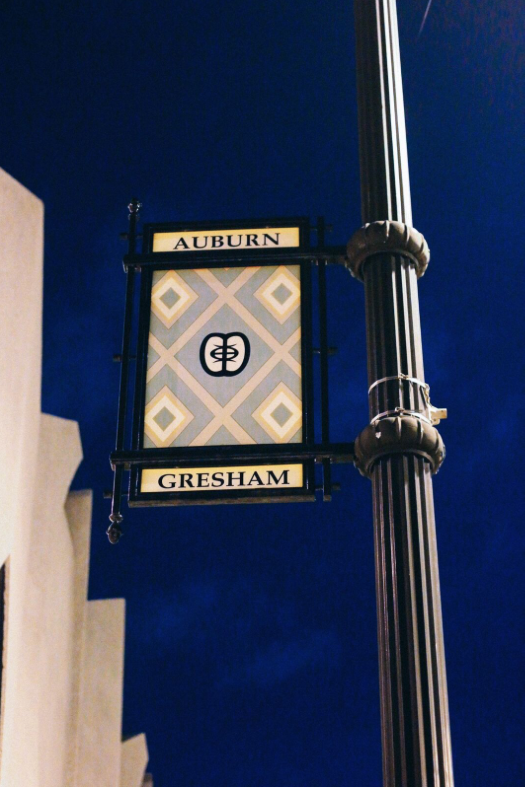 Designed by Jacobs/Ryan Associates for the Chicago Streetscape Program, the tiles were part of a project to enhance Auburn Gresham’s commercial district and reinforce the area’s cultural identity. In addition to trees and fence planters, the firm chose to incorporate symbols and patterns from two significant cloths of the Akan people of West Africa: the hand-woven Kente and the stamped Adinkra. The former were mounted on lampposts, the latter imprinted in the pavement. “Adinkra” means farewell in Twi, the language of the Ashanti, a subgroup of the Akan people. Originating in the nineteenth century, the hand-printed fabric became known as Adinkra cloth because the Ashanti traditionally wore it for funerals. Proverbs, household objects, people, animal behavior, and historical events are symbolized in the geometric forms stamped onto the cloth. Adinkra symbols pavement art, 79th St. between S. Wallace St. and S. Ashland Ave.
Auburn Gresham is where I spent my childhood days growing up and going to Cook School and then for one and one half years at Calumet High School. It was a great neighborhood and safe back in the 50s and early 60s. when I returned with my wife and young children to visit my childhood neighborhood, I could readily see that things had changed. 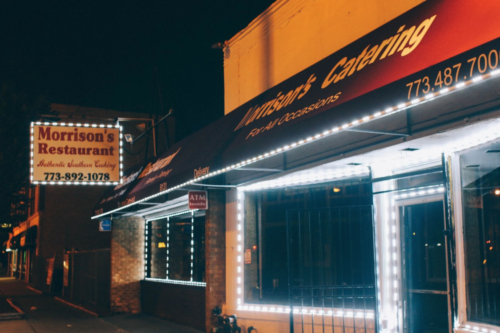 Driving down 79th Street was an eye-opener seeing all the steel screens over store windows and signs saying ‘DEATH TO SHOPLIFTERS’. I just wanted to turn my car around and get out of there. In 1956 I played baseball on the Athletics team in the Southtown Little League. Our team went undefeated and won the Southtown Little League Championship. Unfortunately I have not been able to find a photo of the team and have only been able to locate one other team member, Bob Dykema. Jimmy Cavanaugh was also on the team.